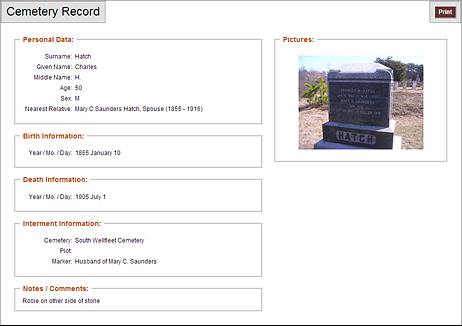 The Cemetery Records module is a powerful tool to collect and present data about cemeteries in your area and the persons who are interred in them. Data can be set to be publicly available or for members only viewing of detailed information. The search tool will return results in either mode, but will only display details to those matching the access mode. Each cemetery, when created in the system can be customized to diplay only the data fields that are available for that cemetery. Pictures and maps of the cemetery may be added as well to enhance the visual display. Once the cemetery has been created, records may be added. 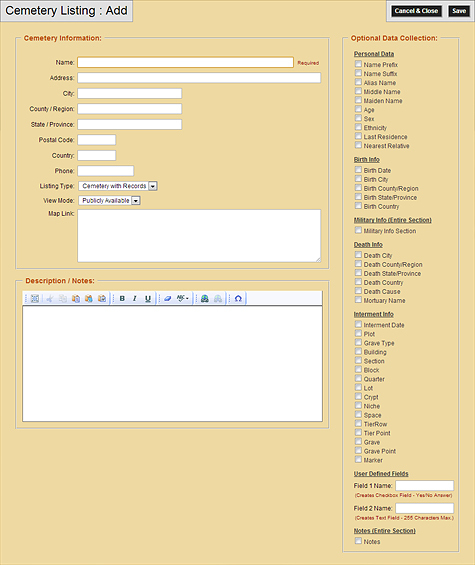 If you already have records in some data format, EasyNetSites can help you convert them tou our database format and upload them to the system. 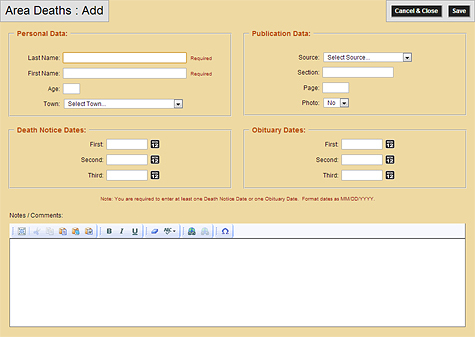 The Area Deaths module provides a searchable database driven interface for death notices and obituaries. It collects data about the person, where the notice was published and dates of publication. All surnames in your research database include spelling variations, City/Town, State/Province, Country and Beginning and End dates. Information entry is simple and direct for the person with editing permission. Email queries may be sent to a submitter, but all personal contact information remains confidential.